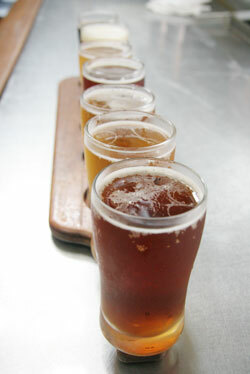 Many brewpubs, including Sam Choy's Aloha Brewery, offer visitors a "sampler platter" of their beers so drinkers can explore the range of tastes. Nowhere in the orange fluorescent lettering above the entrance to Sam Choy's Nimitz Highway restaurant does it mention the large brewery running along one edge of the cavernous building. » Mug Club: More than 500 loyal beer drinkers have joined the Big Aloha Brewery Hui, where $50 buys a shirt, personalized stein and a lifetime of discounted beer. Not that it's easy to miss -- Big Aloha Brewery might be Hawaii's most interactive brewing facility. With tables several feet away, the four fermenters and six serving tanks often draw attention from customers, who often come up to ask questions. "It's very satisfying to look across a room of people clearly enjoying something that you make. That's really big. That's a good feeling," said brewmaster Dave Campbell, who has worked at the brewery since its start more than decade ago. "There's a certain romance to brewing They don't understand it but they think it's cool." Campbell stirs the grain in a large copper tank, as it is mashed to extract sugars. A semisweet cooked cereal smell wafts across the room as customers -- mostly locals, Campbell says -- munch on a midweek breakfast. "When the brewery opened, there was a big emphasis on cigars," he said. "It didn't necessarily mesh with the family restaurant. The brewery is still here, and the cigars are long gone." Big Aloha also moves about 60 kegs a month to 10 Oahu locations, including Tiki's Grill & Bar in Waikiki and Ryan's Grill in Ward Centre, but the majority of sales are at the Nimitz location and Sam Choy's Diamond Head restaurant. Campbell ticks off about 15 styles of beers he would like to make on top of his best-selling Kakaako Cream Ale and a half-dozen others on tap. "It is nice to do that different batch because you plan for it, you target what you are looking for, you do the math and you kind of formulate a recipe," he said. "We say we're going to come very close the first time and you should nail it by the second time."